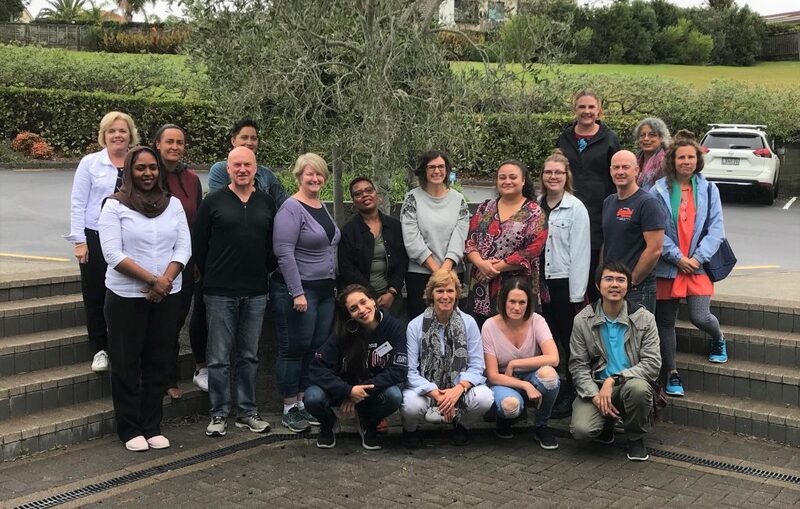 Earlier this month, AUT postgrad research students and expert facilitators descended on Vaughan Park Retreat in Long Bay for 3.5 days of uninterrupted writing bliss. No jobs, no kids, no chores – no responsibilities except putting pen to paper or fingers to keyboard. The Graduate Research School runs these writers’ retreats 2-3 times per year, and they are fully funded – meaning that if your application is accepted, you just turn up with your writing materials, and your accommodation and meals are all provided! There are also thesis-writing experts on hand to guide you in your writing. The writers retreat has helped me shift from a stagnant space to a more confident and active place. The supervisors gave me valuable information to help me see a better perspective of how I can write my thesis. Now I am feeling more confident about my writing. Having my immediate living concerns removed (good food, comfortable bed with writing desk and convenient, clean bathroom facilities) provided a release from the everyday niggles that get in the way of writing. The built and adjacent natural environment at Vaughan Park is inspiring, which I have data to prove is so important! Equally important to me were the facilitated workshops (just the right number), availability of one on one help, and collegiality of fellow students. This week has been the best thing I’ve done in my PhD journey to date. The experiences I had at the retreat, and the things that I learned, were profound. I am certain that my final product (the thesis) will be much better as a result. Here are some of the many reasons why: *I now know how to thread the research question through the thesis chapters, and I understand why this is important; *I’ve reworked the chapters, so that my thesis tells the story of my research in an interesting and persuasive manner; *I’ve learnt a host of ‘tricks of the (writing) trade; *I now understand what the examiners are likely to be looking for; *I made great contacts with other students, and feel far less alone – important for me as a distance student. Learning at the retreat takes place in significant and unexpected ways. It’s not only the deep immersion in the writing and research process that is helpful. It’s also the facilitated discussion led by Jennie and Julie [Associate Professor Jennie Billot and Dr Julie Trafford] that takes our thinking to a new level. We were challenged to lift our own standards and think more critically about the story our research is telling and the difference we will make to practice. I feel like I’ve just completed an advanced course in project management – the PhD thesis being the biggest project I will ever manage. I know how to pre-empt problems, navigate complexities and keep all the stakeholders happy! I attended the writers retreat and found this to be a most worthwhile and productive time in assisting with my writing for doctoral research. I hope that AUT continue to support future retreats. I became in tune with my writing and found the creativity that I had been missing in the research process. It also allowed me to find out what type of environment I need to be able to write. Thank you so much for the opportunity to attend the writers retreat last week. I came home feeling reenergised and really enthusiastic about my writing. It’s hard to identify any one thing that made it so helpful, I put it down to a combination of the peace and quiet, the workshops, facilitators and time spent with student colleagues. The lovely food, lack of teenagers and beautiful scenery certainly helped too. The next GRS Postgraduate Writers’ Retreats will take place from 2-5 September and 4-7 November 2019. Entry is by application, and we’ll post details here on Thesislink (and on the Postgraduate Research Events page in the Student Digital Workspace) closer to the time.